If have written about organ meats in the past. Organ meats are the most nutrient-dense foods on earth. My most favorite is chicken liver. 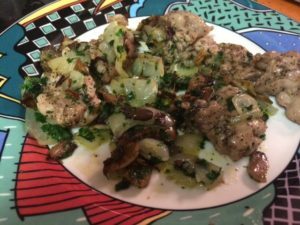 This recipe uses sweetbreads, which can be either thymus or pancreas. Thymus is my second favorite organ meat. Sweetbreads are exceptionally high in protein, Vitamins C and B12, selenium, and phosphorus, among many other nutrients. Sweetbreads are not only nutritious; they are delicious. This recipe creates a very succulent dish. Sweetbreads are generally tender and creamy. The butter and olive oil make it all the more delicious. If you have never tried this delicacy, I suggest you try it. You may be surprised. This may become one of your favorites. 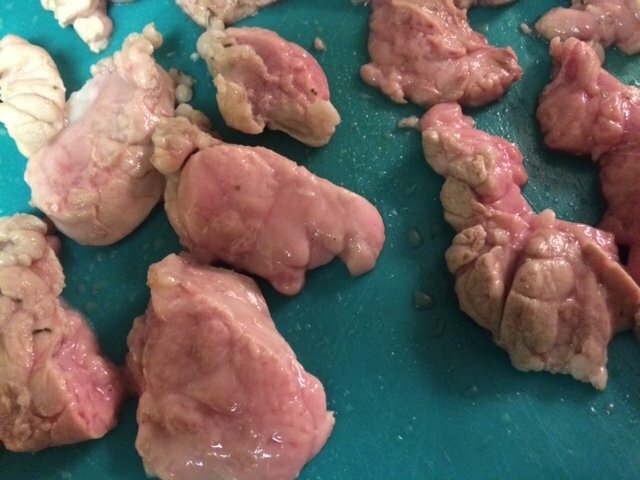 Rinse sweetbreads thoroughly in cold water. In pot, bring water with wine, salt, thyme, and dried parsley to a boil. Reduce to a gentle simmer. Add sweetbreads and poach for 3 minutes. Remove the sweetbreads, discard the liquid, and place the sweetbreads on a cutting board to cool. Once the sweetbreads are cool, remove any membrane and slice them into approximately 1/2-inch-thick pieces. Salt and pepper sweetbreads on both sides, and go to next step. In separate saucepan, add olive oil and butter; heat to low. Add mushrooms and onions, and cook until they are soft and golden. Remove mushrooms and onions, and set aside. Raise heat to medium, and add additional oil and butter if needed. Place sweetbreads in pan, and cook until they are golden brown (only 2-3 minutes on each side). Be sure not to overcook. Plate the sweetbreads, and return the mushrooms and onions to the pan. Add fresh parsley and cook for additional 1 minute. Drizzle the butter and mushroom mixture over the sweetbreads, and enjoy.